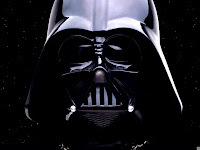 Science Fiction Geeks - Scifi News: Darth Vader opens Wall Street today! The economy trembles. Darth Vader opens Wall Street today! The economy trembles. Is the Dark Side to blame for our economy? Check out the video below - I think the evidence is pretty clear that Darth has been at work, possibly partnering with the banks to get us into our mess. I totally hoped I'd see Luke or Obi-Wan pop out with a light saber and have the two battle it out on the stock market floor.